Emily began her Vista journey in July of 2011. Prior to starting at Vista, Emily attended James Madison University for her bachelor’s degree in psychology. Immediately afterward, Emily attended the University of Delaware and received her master’s degree in school psychology in 2009. Emily worked in the Delaware public school system for two years, and then she and her husband decided to move back to Central Pennsylvania. That’s when she saw the posting for the School Psychologist position at Vista. She was reluctant to apply because the posting was for a part-time role, but decided to apply and came for an interview. Vista offered her the part-time School Psychologist position along with a part-time Behavior Technician position to increase Emily to full-time status. She did this for four months before the School Psychologist role became full time. 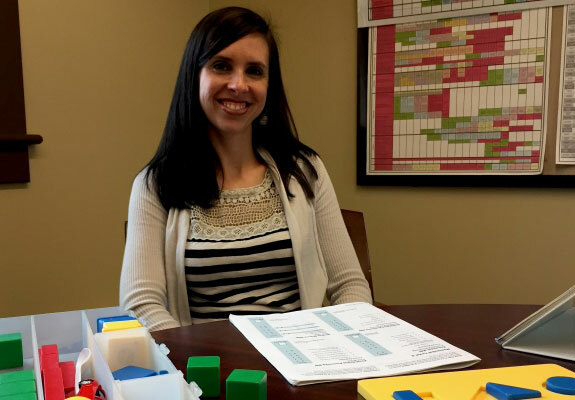 What does a day in the life of the School Psychologist look like? Emily has a variety of responsibilities to her role, including IQ testing, Annual Progress Monitoring, classroom observations, and preparation for Individual Education Program (IEP) and other meetings. Emily also has a great deal of contact with the families of Vista students. What do you enjoy about Vista?